In order to see the FIAPBT Pedigree Online, you doing clic in the photo or in the dogs names. own genetic study in your own way. for example doing clic in the names of the parents, will be able to also visualize its FIAPBT Pedigree Online of four generations, in which if you doing clic in its pictures, will be open in greater size so that it is possible to be seen better the dogs. Following in Pedigree Online and doing clic in the names of the APBT that appear in ascending scale, you can get to find or track the parents of the puppies up to two centuries back, until the years of the 1800, a barbarism of generations, more controlled than the own people. This great amount of genetic information is something unpublished, surprising and exclusive, that only own our wonderful and noble breed dog, the American Pit Bull Terrier. 2019, March 25, the puppies of “BLACK BOUDREAUX” X “NUIT” with 3 months old evolve perfectly, they are perfectly well, devouring totally its dry food and exercising with the game. They're beautiful!!! ´Thank You!!! * Puppies available for sale right now; 4 males. We give the ADBA Pedigree in your hand. 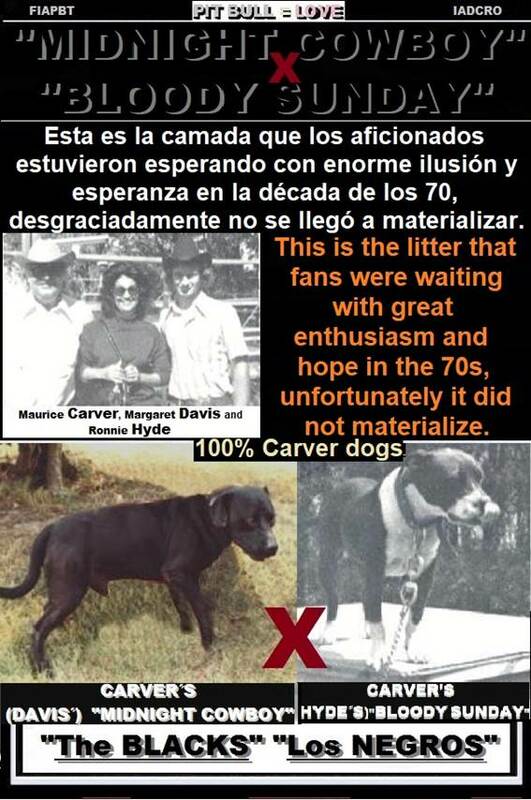 With this litter we intend to carry out a work of recovery and conservation of the genetics of MAURICE CARVER dogs, using descendants of his best dogs; CARVER'S (HYDE´S) “SATCH”, CARVER'S (HYDE´S) “BLOODY SUNDAY” and CARVER'S (DAVIS) “MIDNIGHT COWBOY”. At the time of delivering the puppies to their respective new owners, we are governed in the delivery by rigorous ORDER RESERVATION. 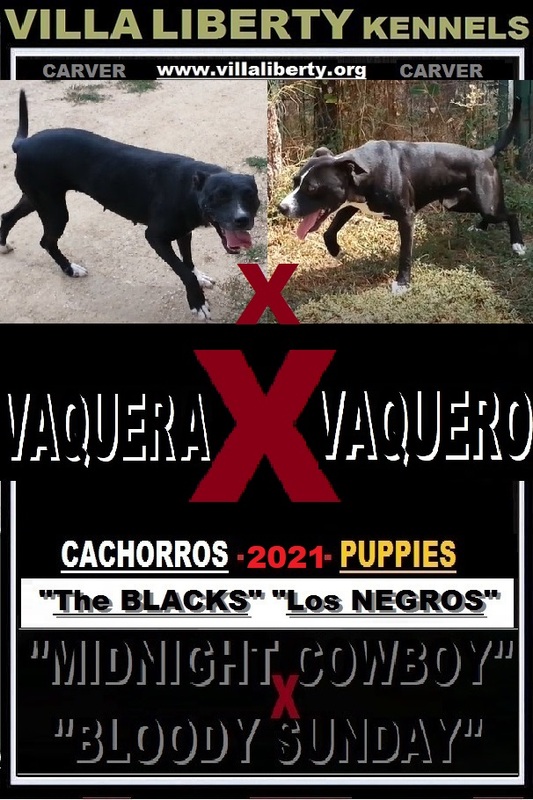 These two parallel genetic pathways, as we have already pointed out, have as their common denominator two of the best dogs of "The BLACKS" breeding in the MAURICE CARVER life, the aforementioned CARVER'S (DAVIS) MIDNIGHT COWBOY & CARVER´S (HYDE´S) “BLOODY SUNDAY”. Who will be observers, when see the picture of "BLOODY SUNDAY" and comparing it with the puppies of this litter, you can see the phenotypic qualities of "BLOODY SUNDAY" that despite the enormous number of years elapsed since his death, being the mother of the great-great-grandmother of these puppies, can see very well impregnated it in these puppies that we present today, one of the best evidence of the veracity of the origin of the puppies, since its phenotype clearly reveals that they could pass as direct children of "BLOODY SUNDAY", curiosity or detail unmistakable DNA by inheritance of the GENETIC phenotype. In the same way it happens with CARVER'S (DAVIS) "MIDNIGHT COWBOY"
The puppies of this litter were born on December 11, 2018 and will be prepared to go to their new families in February 2019, with two months of age, when they are perfectly weaned from the mother, wormed, at least with a puppie vaccine and eating food dry of puppy. The puppies of this litter, will be strong and athletic with good bone. The puppies will be very intelligent dogs with a great physical and psychic potential, to develop hards Works-Deports of resistance (River, Sea, Mountain, MarathonPit, Weightpulling, etc.) and also like a wonderful family Pet dog, for the balance in all the senses that own its ancestors. 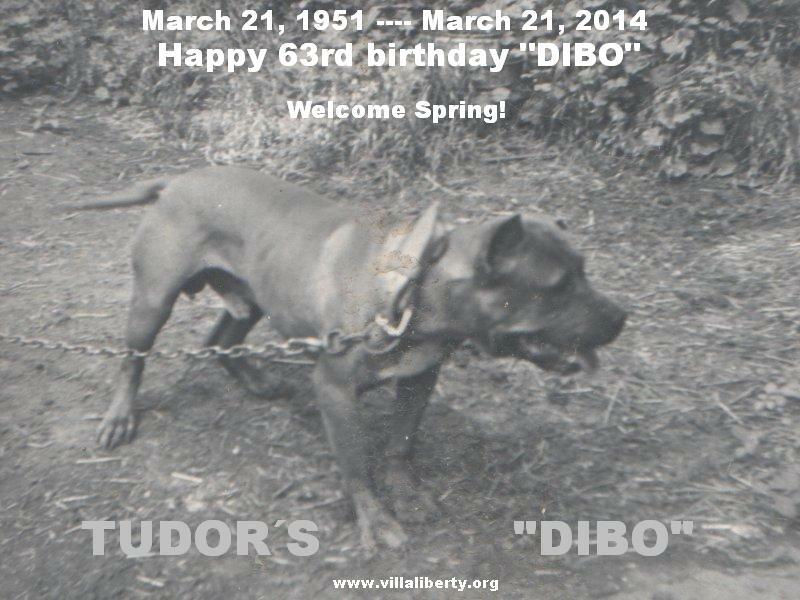 This class of doggies in nowadays, are Patrimony and Heritage of the breed and its fans… Only is EXTRAORDINARY!!! A genetic treasure!!! For those that have an average knowledge on the breed, the words to describe this litter also are unnecessary. This will be the last litter in the “RED IZA” life. The puppies of this litter will be born for 2019 and will be prepared to go to their new families at two months of age, in 2019, when they are perfectly weaned from the mother, wormed, at least with a puppie vaccine and eating food dry of puppy. The puppies of this litter, will be strong and athletic with good bone. The puppies will be very intelligent dogs with a great physical and psychic potential, to develop hards Works-Deports of resistance (River, Sea, Mountain, MarathonPit, Weightpulling, etc.) and also like a wonderful family Pet dog, for the balance in all the senses that own its ancestors. “RED IZA” have a great functionality combined with exceptional heart. Also it is balanced in all the senses. “RED IZA” is a very complete APBT in all the aspects important to consider, undoubtedly one of our best females. We are very proud of her. With this litter we intend to carry out a work of recovery and conservation at the present time of the genetics of “RED PIT”, the best American Pit Bull Terrier in the Villa Liberty kennels life. 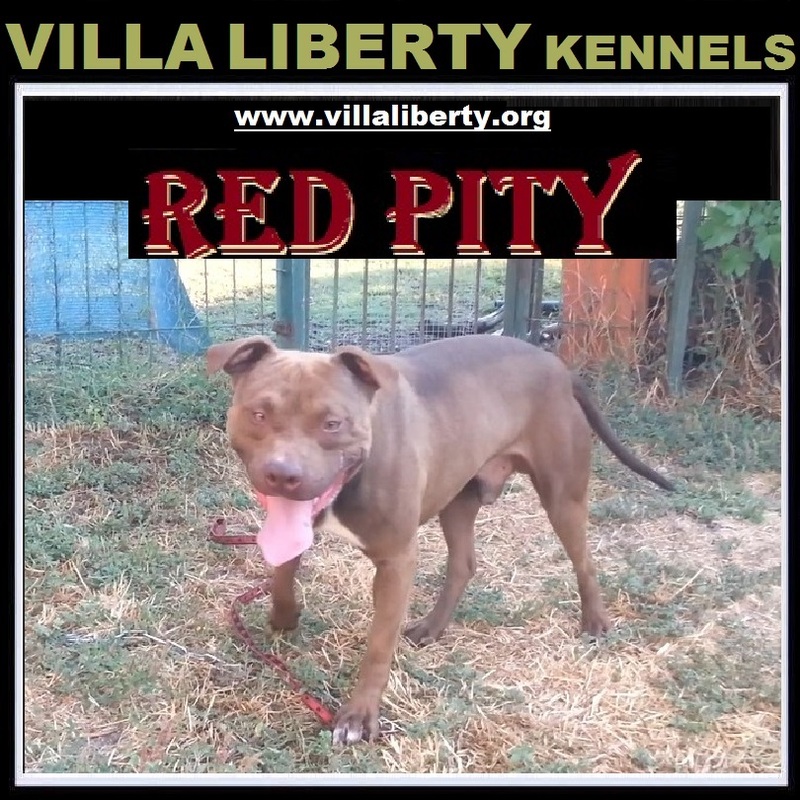 This recovery and conservation will be developed at Villa Liberty kennels through the best descendants of “RED PIT” in nowadays, “RED JERO” X “RED KARMA”, which and as an example of success guarantee, both are the same genetics or blood that have the only 4 Champions (ACE) of WeightPulling in the history of Europe, we refer to ACE SPORTBULL'S "VENUS" and their two grandchildren called ACE SPORTBULL'S "MAXIMO" and ACE SPORTBULL'S "DANA". * ACE = CH in Work Sports Competition WeightPulling Official by the ADBA. It is worth mentioning the Pit Bull called "RED TOTEN" (son and grandson of "RED PIT"), which got the Spain record in this work discipline of WeightPulling, when pull 2100Kg., Weighing 20kg. and obtaining a coefficient of 105. This result was got the day after "RED TOTEN" was just one year old, in the official Championship that took place in Oklahoma, on October 11, 1999. I feel very excited, very grateful and very proud of all... ´Congratulations Champs!!! THANK YOU!!! This will be the last litter in the “RED KARMA” life. The puppies of this litter will be born by the end of May 2019 and will be ready to go with its new families with two months of age, at the end of the month of July 2019, when they are perfectly weaned from the mother, wormed, at least with a puppie vaccine and eating food dry of puppy. The puppies of this litter, will be strong and athletic with good bone. The puppies will be very intelligent dogs with a great physical and psychic potential, to develop hards Works-Deports of resistance (River, Sea, Mountain, MarathonPit, Weightpulling, etc.) and also like a wonderful family Pet dog, for the balance in all the senses that own its ancestors. “RED KARMA” is a very intelligent American Pit Bull Terrier, with great functionality combined with exceptional heart. It possesses an exceptional balance in all the most important ways to be taken into account. “RED KARMA” is one of our best females. -- ACE “VENUS” -- // AMERICAN PIT BULL TERRIER LEGENDS OF THE PRESENT HISTORY. The Only 4 Champions (ACE) of WeightPulling in Europe // ACE "VENUS" was the first ACE in Spain and in Europe. CH ACE "TITO", which is the first and only specimen one of the breed that get both the ACE and the CH ADBA of European history. Clicking on the pictures, be will open its respective FIAPBT Pedigree Online, where you can perform their corresponding genetic study. 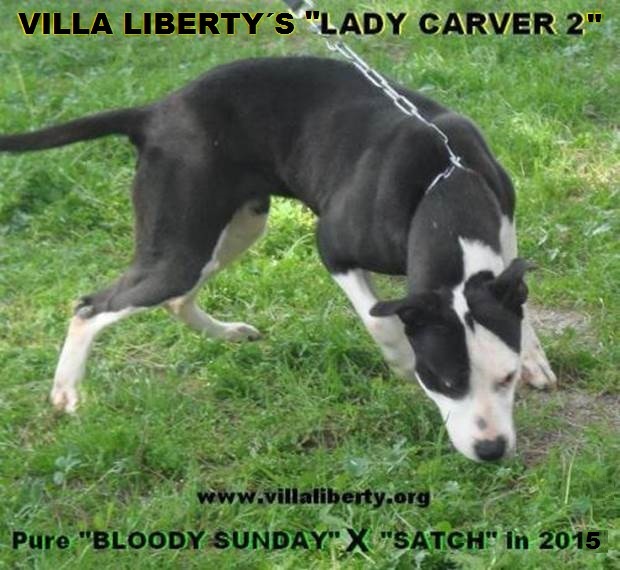 CARVER'S (HYDE´S) “BLOODY SUNDAY”, is daugter of “Bullyson” and the Grandmother of Smith & William's “Reuben” (100% Carver), Villa Liberty´s “Tudor Dibo” (100% Carver), “Chinaman” (100% Carver), etc. “BLOODY SUNDAY” gave a huge quality contribution to the "The Blacks" consolidation. The American Pit Bull Terrier known under “The Blacks” term were originated under the guidance of the master dogman Maurice Carver, especially through the breeding that made ​​Carver with “BULLYSON” and also with some other crosses of “ELI JR” and descendants of “BRENDY” because are the two littermates of “BULLYSON”. 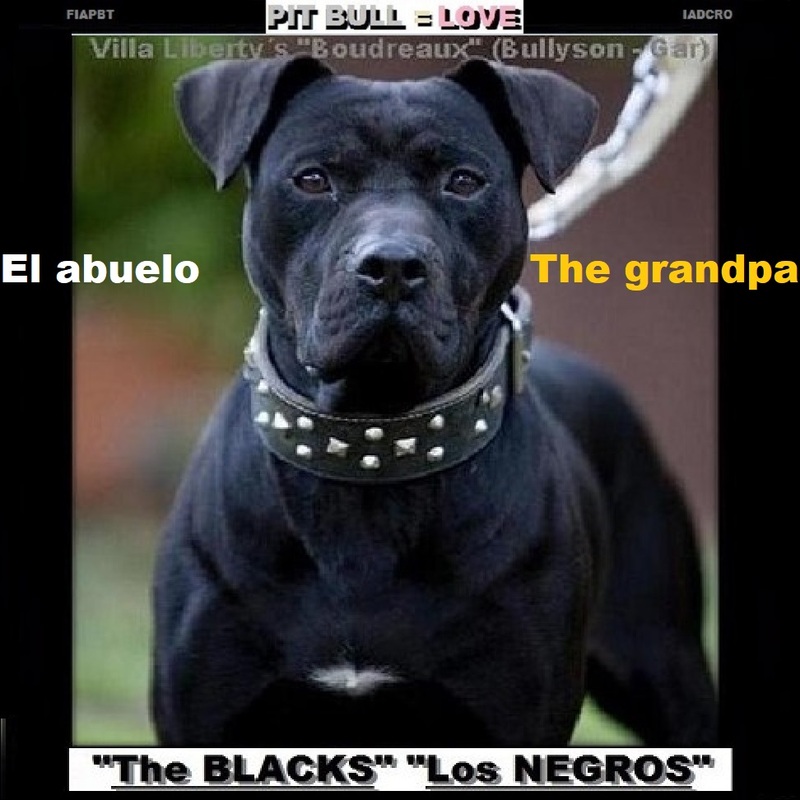 Finally, “The Blacks” term was consolidated over time by the work of breeders who used it in their respective breeding genetic from The ELI Dogs, especially through “BULLYSON” genetic to consolidate and extend to a diversity of the descendants of three brothers, whom the black on the mantle of your skin also predominated over white. 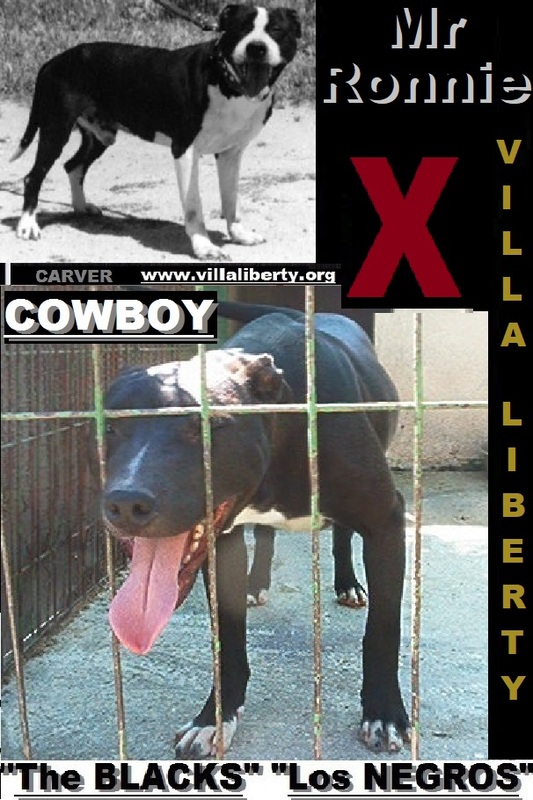 In Villa Liberty kennels, is not sufficient to us simply with breed and select to the original and genuine American Pit Bull Terrier of pure breed or authentic 100%, the genetic quality and the quality in the aspects of good health, good character and good behavior like dog of Work_Sport, or familiar dog, for us is equal of important. Satisfies us enormously, that our clients are satisfied and happy by the genetic quality, of character and behavior in all the aspects with their American Pit Bull Terrier, which acquired in Villa Liberty kennels. We are thankful to them of heart to all of them to let to us know it, to trust in our work and to trust in our dogs. We guarantee our dogs to 100%, not those of the others, although some of these descend from ours. WE ARE PROFESSIONAL IN THE AMERICAN PIT BULL TERRIER BREEDING. FIRST OF ALL AND ALL, WE TOOK CARE OF AND WE CONSERVED THE PURITY OF THE BBREED IN OUR DOGS, IN VIEW OF THE NEGATIVE PRESENT PANORAMA OF THE PURE BREED BY DIVERSE FACTORS. WE BREED BY QUALITY NOT BY QUANTITY. WE GIVE ALL THE PUPPIES TO THE NEW OWNER WITH THE ONLY INTERNATIONAL OFFICIAL PEDIGREE, THE ADBA PEDIGREE. We preferred not to place our credit inside the historical pictures, since we considered that it is a way to spoil it, diminishing the fan enjoying and would damage to an historical value, which is patrimony and inheritance of the own breed. 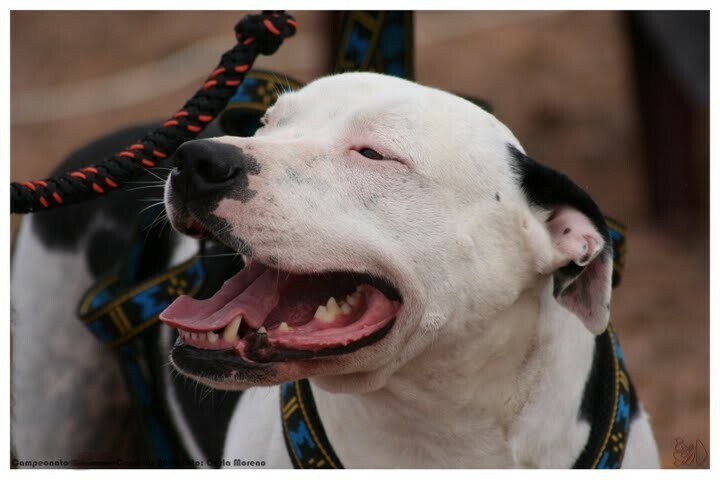 In order to see the FIAPBT Pedigree Online and pictures, you must doing clic in its corresponding name. Once within his Pedigree Online, you can realise your own genetic study in your own way. for example doing clic in the names of the parents, will be able to also visualize its FIAPBT Pedigree Online of four generations, in which if you doing clic in its pictures, will be open in greater size so that it is possible to be seen better the dogs. Following in Pedigree Online and doing clic in the names of the APBT that appear in ascending scale, you can get to find or track the parents of the puppies up to two centuries back, until the years of the 1800, a barbarism of generations, more controlled than the own people. This great amount of genetic information is something unpublished, surprising and exclusive, that only own our wonderful and noble breed dog, the American Pit Bull Terrier. In order to facilitate the genetic study of our dogs and the breed itself, also we add to the fans the Online Pedigree database to facilitate his study, because the Online Pedigree could facilitate the genetic study those fans, which are accustomed to do it through of this database. However we must clarify, that this database the genetic study is more confusing, more annoying, more incomplete and less reliable by various factors, which come it because of malicious and unscrupulous people, who for various dark interests them stain and harm the honorable name and efforts being made for over 10 years ago by the Online Pedigree owner. These negative and various factors that are affecting the database Online Pedigree, for the experimented dogman in the breed genetics and those who have been affected directly in them, is well known it for them, and they know very well what we are talking about. 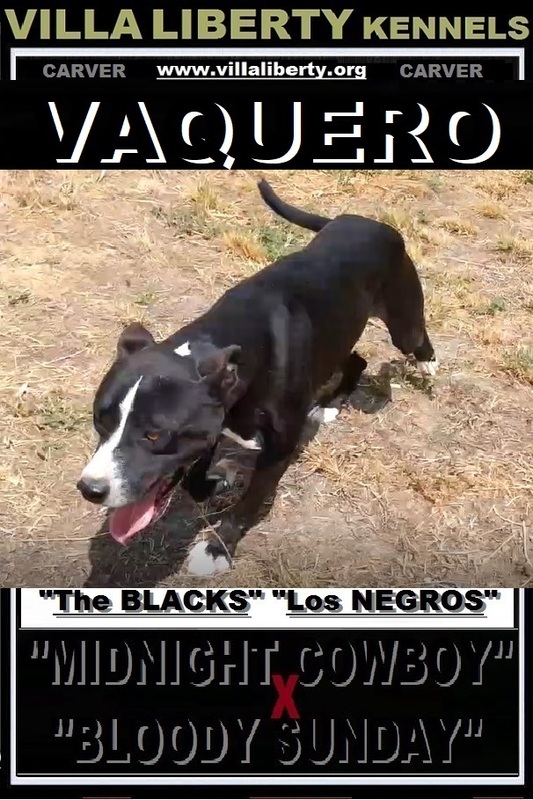 Some of these negative factors are for example: Registers of mixed dogs like pure APBT; Registers of Bullies or similars like pure APBT; Fake registers of dogs that do not correspond with the reality; Registers of dogs that no exists to deceive or swindle to the fans; Be made countless of duplicate records for the same dog with dark purposes, etc., etc. 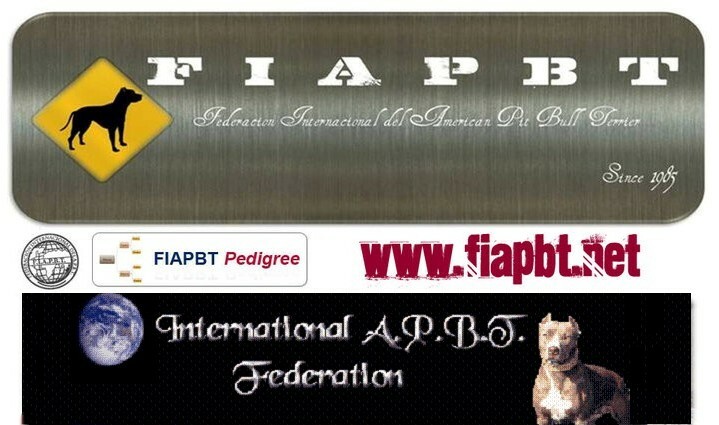 These drawbacks in the database FIAPBT Pedigree Online are very low or zero, due to the strict monitoring and control that is constantly performed by dogman amply qualified to preserve the breed purity. Villa Liberty´s CH “Patches” You can see my VIDEO doing clic in my pic or in my name “PATCHES”. * VIDEO of CH “PATCHES” in its daily life.
. HOW WE GIVE OUR PUPPIES? REMEMBER IT, if you are living out of Spain and you are interested in same of our puppies, you must to come to pick up the puppie in Villa Liberty kennels and we are located in Madrid, Spain, Europe. The name of the International Airport is “BARAJAS”. The way is easy to do. We are sorry because I can´t to send puppies out of Spain. IMPORTANT: In Villa Liberty reserved us the right to only sell our puppies to people who we consider are sufficiently responsible and we will think that are good owners for our American Pit Bull Terrier.